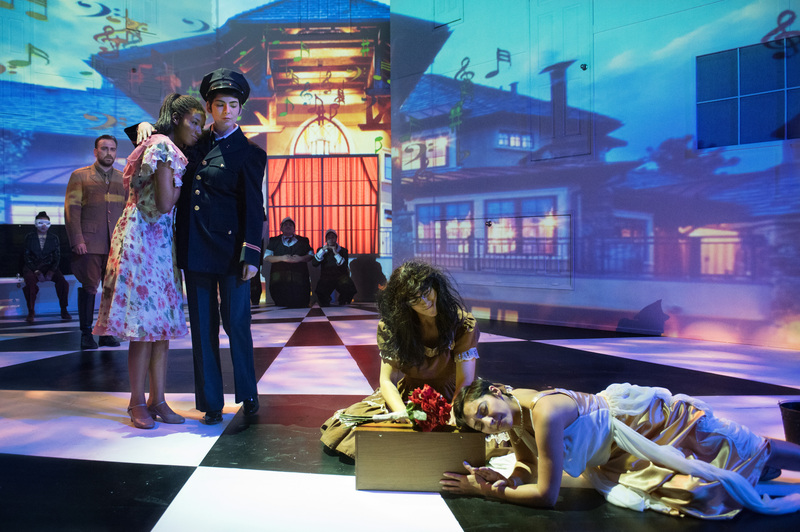 The UCSC Theater Arts department emphasizes a multi-disciplinarian approach to theater, encouraging exploration and engagement with all aspects of theater production, and an education based in both academic and production work. A student majoring or minoring in Theater Arts will receive a Bachelors degree in the general Theater Arts. The department does not have at this time any official concentrations, with the exception of the Dance Minor. That said, some students do choose to focus their studies towards developing their skills in a particular aspect of theater, utilizing the UCSC Theater Arts curriculum and opportunities. If you are considering such a path for your own undergraduate studies, we encourage you to consult with the Undergraduate Advisor to determine which classes and opportunities are available when, and to plan out your courses. If you are a designer, or a student interested in pursuing design, we offer a range of courses from the basic and introductory, to the advanced, from the practical and technical, to the theoretical and historical, in the different areas of theatrical design. Thea 10 - Intro to Design. This course is required of all Theater Majors. It offers an introductory survey of the histor and theory of all aspects of theatrical design. Thea 14 - Introduction to Drawing. A basic skill essential to costume and scenic designers, and helpful for anyone working within the visual arts. Thea 17 - Costume Construction. Covers materials, tools, and techniques of costume construction. Students will construct basic and advanced pieces under supervision of the instructor, and be given the use of some costume shop materials and equipment at assigned times. Thea 19 - Introduction to Lighting Design. Covers the theory and practice of lighting design for the stage, in various theaters, and using the theaters of the department as examples. Also trains in the use of current lighting design programs and the use of plots. Thea 52 - Basic Stagecraft. Introduction to technical theater and basic stagecraft, examining two-dimensional and three-dimensional scenery, scenic engineering, the physical theater, stage and scene shop equipment, project organization and process, technical theater graphics, materials, and theatrical construction techniques. The Theater Arts department also offers Thea 50, or TA 50 every quarter. This two-unit course covers 50 hours of work done towards Theater Arts Department productions, including work done in the scene shop, costume shop, or on the light-hang electrics crew. Students enroll in the class, and then sign up for a specific shop or show during the TA 50 Meeting, generally held the first Wednesday of each quarter after auditions. Theater Arts Majors are required to complete 3 quarters of TA 50 in order to graduate with the major, and Minors are required to complete one quarter. Work in the shops or crews as part of TA 50 includes instruction in safety, introduction to the shops and department equipment, and practical instruction necessary to the supervised work needed to be done for the producutions you will be working on. TA 50 is quite possibly the best way to get to know the shops and equipment of the department, to get to know the staff and technicians, and is the best way to receive training and instruction in areas of production you lack experience in. Thea 114 - Sound Studio. Thea 115A - Scenic Design. Thea 117 - Costume Design. Thea 119 - Lighting Studio. These courses fulfill the upper-division studio requirement of the Theater Arts Major. While priority is given to design students within the major, any student of any level of background is generally welcome to enroll in these classes, though certain prerequisites may apply. Additionally, certain quarters faculty may invite advanced theatrical design students to enroll in graduate level DANM (Digital Arts and New Media) courses, covering light and media projections in performance, new performative technologies, and more.